Patentable subject matter - any process, machine, manufacture, or composition of matter, or improvement thereof is patentable subject matter. Your invention should not be merely an abstract idea or something that constitutes a natural phenomenon. If you are concerned that your invention may not meet the patentable subject matter requirement, you should check with an attorney. Utility - your invention must have a use, and it must achieve that use. For example, attempting to patent a perpetual motion machine will result in a rejected patent. Also, the invention's use must be lawful at least somewhere in the United States. Novelty - Under the new AIA rules, the rules relating to novely have changed. Your invention must not have been invented by another person, and it must still be new when you file the application. There are exceptions to these rules, but the exceptions are complex and the courts are still developing case law precedent for the new rules. Check with an attorney if you have concerns about whether your invention is novel. Non-obviousness - your invention must be an extension over other prior existing inventions. When a patent is alleged to be obvious, certain facts must be determined: (1) the scope and content of the prior art (that is, other prior existing inventions), (2) the differences between the claimed invention and the prior art, (3) the level of ordinary skill in the art (that is, what a fictitious "average specialist" would know), and (4) objective evidence of non-obviousness such as commercial success, long-felt but unsolved need, failure of others to create the invention, copying the invention, and unexpected results which ended up as the invention. Greenwood v. Haitori Seiko Co., 900 F.2d 238 (Fed. Cir. 1990). Courts then use these facts to determine whether the invention was obvious or not. Section 112 - There are four basic parts to meeting the Section 112 requirements: enablement, written description, best mode and definiteness. Written description - you must include a written description that is sufficient to describe what you have created and allow a person of ordinary skill in the art to make the invention. You cannot claim anything beyond what you have discovered, but you are not necessarily limited to claiming only those inventions which you have tested. Best mode - you must list what you think is the best use for your invention. Definiteness - the invention must be described so that it does not leave a person of ordinary skill in the art guessing as to what you have invented. Note that not all considerations in filing a patent application have been listed, and your invention may still be barred from becoming a patent for another reason. You should review your invention with a lawyer to see whether there are other considerations to take into account in your situation. Once you have met the requirements to get a patent, you can file a patent application with the PTO and then "prosecute" your patent application. However, because of the technicalities of PTO procedure, you should consider hiring a patent attorney to prosecute your patent. Also, if your patent application's claims are not written properly, the patent that issues may not cover all of your invention. A patent attorney has the training and experience to draft the claims in your patent application so that the claims cover your invention. 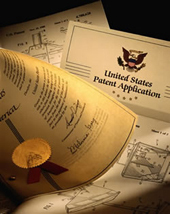 For more information about patents and the patent application procedure, see the U.S. PTO website, at www.uspto.gov, which has a page for Inventors and Entrepreneurs, http://www.uspto.gov/learning-and-resources/inventors-entrepreneurs-resources. Note the law school clinics and pro bono sections. Note: There are many unscruplous "invention promoter" companies which entice inventors with promises to get a patent for you and market your invention to industry. Typically, these companies will charge inventors $7,000 to $8,000 or more for their services, and then the state is the fine print of the contract that they will not obtain a patent for the inventor. Use caution when considering their services, and ask questions, such as how many patents they have obtained, and how many people have successfully marketed and made a profit using their services. You infringe a patent if you make, use, sell a product or process that includes someone else's patent. You also infringe a patent if you encourage others to make, use or sell a product or process that includes someone else's patent, and you knew that it the product or process includes someone else's patent. If you have been accused of patent infringement, you have several choices. You may license the patent from the patent holder. You may also mount a challenge to the patent for invalidity or inequitable conduct. A patent is invalid if shown by clear and convincing evidence that it did not meet one of the requirements of patentability, which are discussed in the Patent section of this website. A patent may be unenforceable if you can show certain bad conduct by the inventor or the attorney during the patent's prosecution. Under the new AIA rules, the Patent Trial and Appeal Board hears challenges to patents. Consult with an attorney if you have received a "cease and desist" letter, to discuss your options.